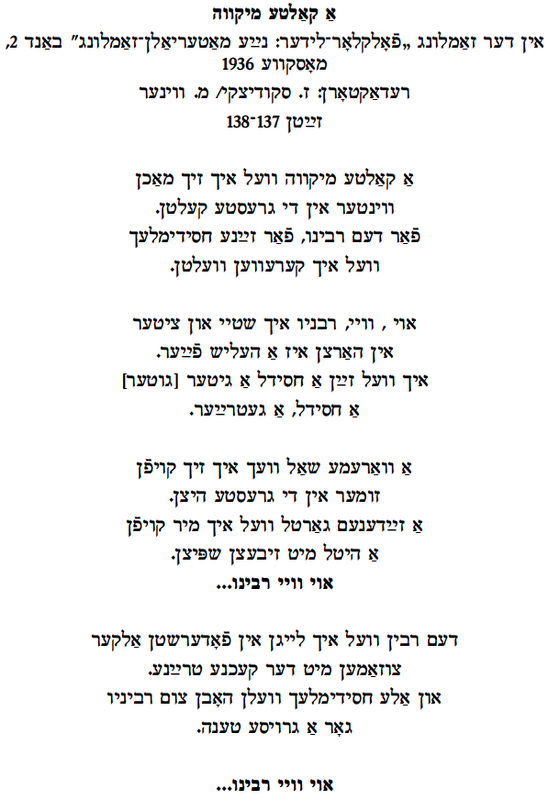 This entry was posted on October 29, 2014 at 2:08 pm and is filed under Main Collection with tags belt, Benjy Fox-Rosen, Bob Cohen, Borsa, Center for Traditional Music and Dance, cold, cook, CTMD, davening, Di Naye Kapelye, Ethel Raim, fire, Galicia, gestures, Gheorghe Stingaci Covaci, Ghizella Sulliteanu, Glina, Hasidic, Hasidim, hat, heart, Isaac goodfriend, Jack Falk, Jan Bart, Josh Waletzky, khosid, Lag B'omer, Maramures, maskilic, melamed, Mikhl Gordon, mikvah, Morris Waletzky, Pete Rushefsky, Poland, pray, rebbe, Romania, shawl, shuckling, silk, students, summer, winter, Yankl Falk, Yermye Hescheles, Zalmen Skuditski. You can follow any responses to this entry through the RSS 2.0 feed. You can leave a response, or trackback from your own site. I don’t understand the reference at Cook Trayn. Some one can help me? 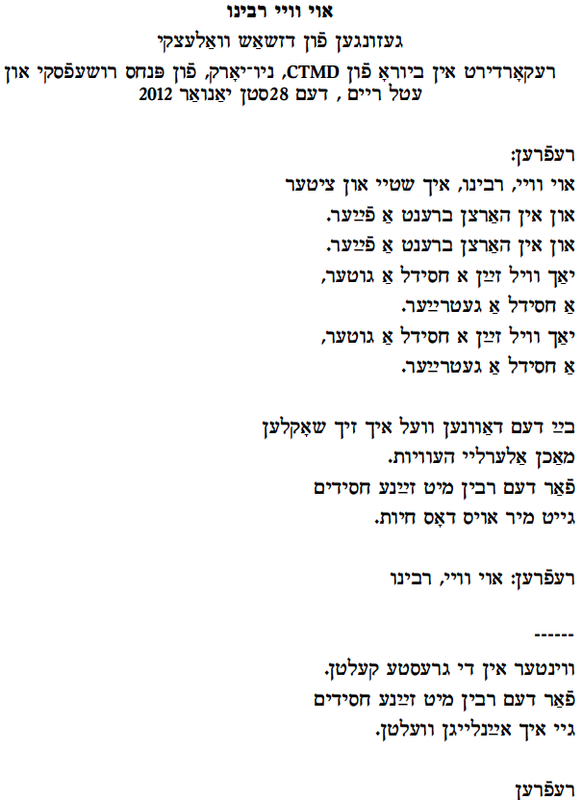 The last verse in the version found in the Yidishe Folklider collection printed above refers to the Rebbe being left alone with the female cook Trayne. Josh, in the chorus, properly uses the Varshever (Warsaw) dialect that is, unfortunately, not reflected in the printed text. It should be: yakh vel zahn a khusidl a giter, a khusidl a gitra-er.